Use of TRX Suspension Trainer, Olympic Bars, TRX Duo Trainer, Heavy Bags, Kettle Bells etc. 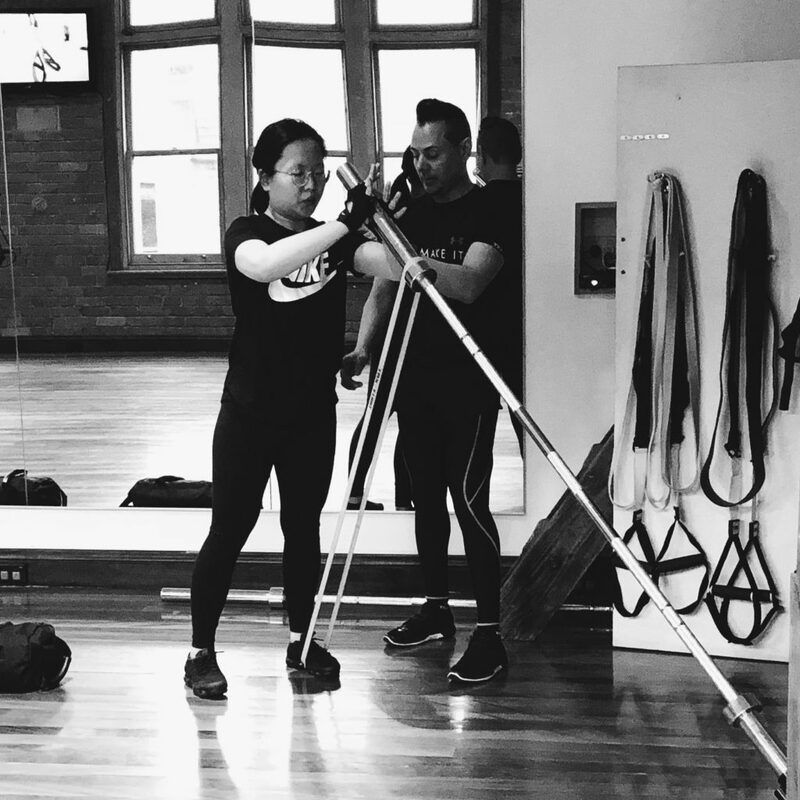 Clients who have been through the Halo program have experienced: faster adaptation (from no experience and unable to lift 15kgs to safely lifting 65+kgs in one S&C 4 week Program), increased strength, faster skill acquisition and improved confidence and consistency.) Individual results may vary. At Apparatus Private Studios, the Halo Sport program utilises Neuropriming through Halo headsets as a part of program preparation. To understand how and why Neuropriming is used and how this would be beneficial for any person wanting to improve training in general or specific training please find the information below. 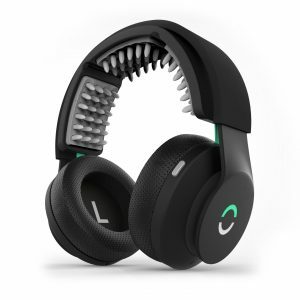 Neuropriming comes from decades of academic research surrounding tDCS, TES, and other types of non-invasive brain stimulation; 1000s of hours of double-blind studies with more than 1,200 people have proven the efficacy, reliability, and safety of Halo Sport and the leadership team brings an MD, a Ph.D, and 30 years in neuroscience to Halo. Their previous company, NeuroPace, changed the lives of thousands of people suffering from epilepsy. Neuropriming is the process of using electrical stimulation (such as transcranial direct current stimulation, or tDCS) to increase plasticity in the brain prior to an activity. This process decreases the amount of input required for neurons to fire, and helps neurons fire together, enabling more rapid strengthening of connections in the brain. When paired with quality training, this results in increased strength, explosiveness, endurance, and muscle memory. How do I provide input to my neurons? Your training, whether it is lifting weights or playing the piano, provides input that causes your neurons to fire. As this happens, your brain fine-tunes the connections between the neurons used to control your movement. Whether Neuropriming or not, no communication and no learning occurs if there is no input. No training means no benefit! So, you need to train while in the hyperplastic state to see benefits from Halo Sport. Why do I wear Halo Sport for 20 minutes? How long do the effects last? It takes time for your neurons to respond to the Neuropriming field. Twenty minutes is the optimal duration for your neurons to begin firing more easily and more together. This primed state will last approximately one hour, after which your neurons will return to their everyday, non-primed state. The benefits from your training, however, will last indefinitely — or at least as long as any other training gains. One of the key brain areas that controls body movement is called the motor cortex. This area is located across the top of your head, spanning from ear to ear. Your motor cortex controls your muscles by sending electrical signals from its neurons to targeted groups of muscle fibers, causing them to contract. By combining these muscle contractions, your brain causes your body to move. Movement is complex: each time your body moves, there are tens of thousands of neurons sending electrical signals. Whether you’re training for a marathon, learning a new piano piece, or working on your vertical, your brain needs to refine how it tells your muscles to make the complex movements required. The brain’s unique ability to fine-tune itself—called plasticity—allows it to do just that. Plasticity means your brain can strengthen existing connections between neurons and even form new functional pathways. Through this process, you progress from the raw, unrefined movements of a novice to the powerful, precise movements of an expert. Optimizing your motor cortex helps your muscles perform better in a number of ways. Motor skills rely on the brain to send signals to the correct muscles and parts of muscles in the right order. Through plasticity, your brain is able to ensure that your neurons are working together for a precise result, like playing an instrument, sinking a putt, or leaping a hurdle. Halo Sport is designed to make your training or practice more efficient by improving your brain’s natural plasticity. By applying a mild electric field to the motor cortex, Halo’s Neuropriming technology induces a state of “hyperplasticity.” When you train in a hyperplastic state, the brain’s normal fine-tuning process occurs more rapidly — meaning better results from each practice rep.
To understand how Halo Sport achieves these benefits, it’s important to understand how neurons communicate with each other. This graph demonstrates what a neuron does when it sends a signal. 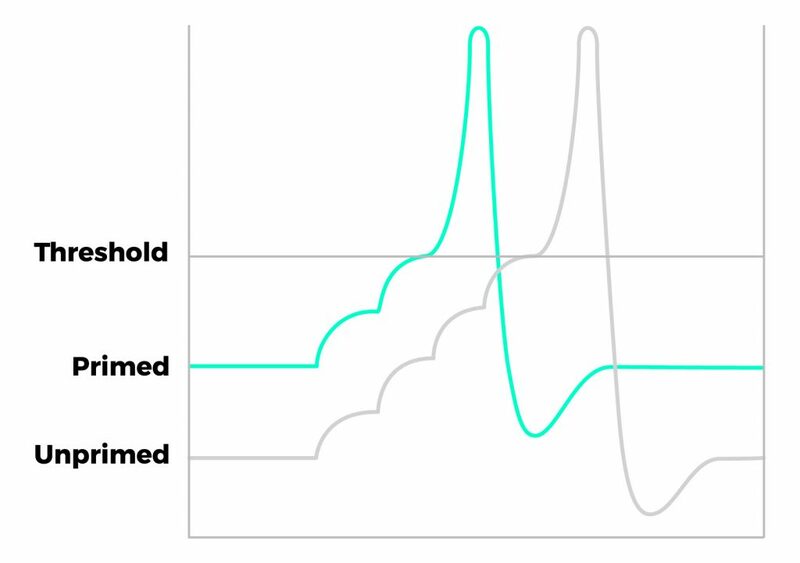 The grey line is a non-primed neuron — it starts at a baseline, and stays there, not sending any signals until it starts to receive information from other neurons (the first bump). Over time, signals come in from other neurons and the line rises. If the neuron receives enough input within a short period of time, it crosses an electrical threshold and sends a signal called an action potential. This is how neurons communicate with each other. The green line represents a neuron primed for hyperplasticity, with an elevated starting point. Similar to the unprimed neuron above, as signals come in, the line again rises until it reaches the electrical threshold and fires an action potential. The difference is that it now takes less input to trigger the neuron to send a signal. This means that more signals will be sent for a constant amount of input, and — even more importantly — nearby neurons will be more likely to fire together. Because plasticity is driven by neurons firing together as they send and receive signals, this leads to hyperplasticity — better, faster fine-tuning of your brain’s neuronal connections. to check our next intake availability, and take your training to another level today.